In life, first impressions are (pretty much) everything. So when a new home announces itself (and, hence, its personality) in rather loud fashion, it sets the tone for the rest of the home. Which can be good or bad, depending on the impression made. In the case of 169 River’s Edge Drive – a brand new Huntington Homes show home – it would be the former. 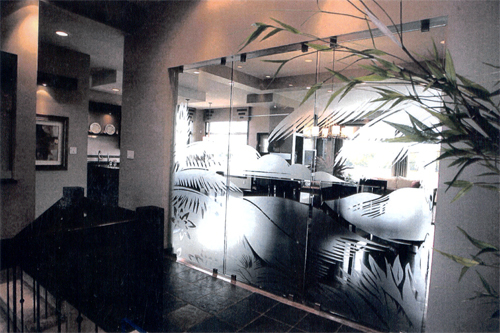 Just inside the front door is a massive etched, tempered glass wall about 14 feet long and 10 feet high. “We came up with the idea for this glass feature wall because we wanted to allow a certain amount of visual into the living room, yet attain a reasonable degree of separation,” says Huntington Homes’ Rob Swan. “By making the ceiling 11 feet in the foyer, and taking the floor tile and ceiling all the way across, we made the area feel bigger than it actually is, and gained a spectacular entrance to the home all at once. Swan says the 2,436-square-foot bungalow (which also has 1,700 sq. ft of developed space in the lower level; more on that later) – particularly the main level – was designed to have two quadrants: the great room/kitchen area, and a private wing that plays host to the den (or second bedroom), master bedroom, bathroom and another bedroom. The kitchen is neatly separated from the dining room by a grey quartz-topped island/eating area with gas cooktop. Aisles are wide in the kitchen and dark-stained (almost black) maple cabinetry with stainless handles make it a gourmet’s delight. After the party (or long day at work is over), you’re then left with two options: head to the bedroom wing for some rest and relaxation, or, if you’re not entirely spent, take the stairs to the basement’s walk-out lower level. As it turns out, both are extremely viable options. Take the master bedroom, for example. Tow large windows provide a spectacular river view, while 11-fot-plus tray ceiling adds style and character to a space with room enough for a queen-sized bed, two end tables, a dresser, an art figure and two plants. A double pocket door entrance then takes you to the ensuite, where a corner jacuzzi, oversized tempered glass shower and maple vanity with grey quartz top await. A large window adjacent to the jacuzzi allows light to flood in, while the earth-tone colors (inlcuding beige ceramic floor) evoke a feeling of serenity. The walk-in closet is also larger than most. Downstairs, a set of double doors leads to a media room and entertainment centre, with room for billiards and a home theatre.